Not only is our "Dacha" (a Russian expression for a home in the country to get away to in addition to a garden to grow vegetables in the summer for use in the winter) a place to have fun, it is also a concept project for us. We are seriously trying to keep to our motto of "Reduce, Reuse, Recycle" in all that we do there. Very little electricity is used. We compost everything we can, including "humanure". For heat, we burn wood gathered from downed trees. We use low energy, eco-friendly flourescent light bulbs. Also, the farmed part of the 102 acres will, hopefully, be certified this coming year for organic crops. Check back once or twice a month for new progress notes! 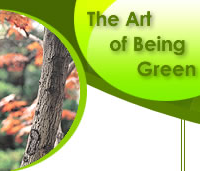 The Art of Being Green is all about renewable energy and a green lifestyle. Visit this website for a feast for the eyes as well as some fun facts and easy tips on being green!